This week’s reviews are from the library’s Outreach Services Division. July’s People is the story about the Smales family, Maureen, her husband, Bam, and their three children, who live a typical, middle class life in a suburban South African community, complete with their house servant, July. When the rumblings of anti-apartheid erupt into violence in their community the Smales family flee their comfortable life, with July in tow, and seek refuge in July’s village. Soon the tables are turned and the Smales are living in an unfamiliar environment, looking to July for his benevolence and guidance for their safety, sustenance, and survival. 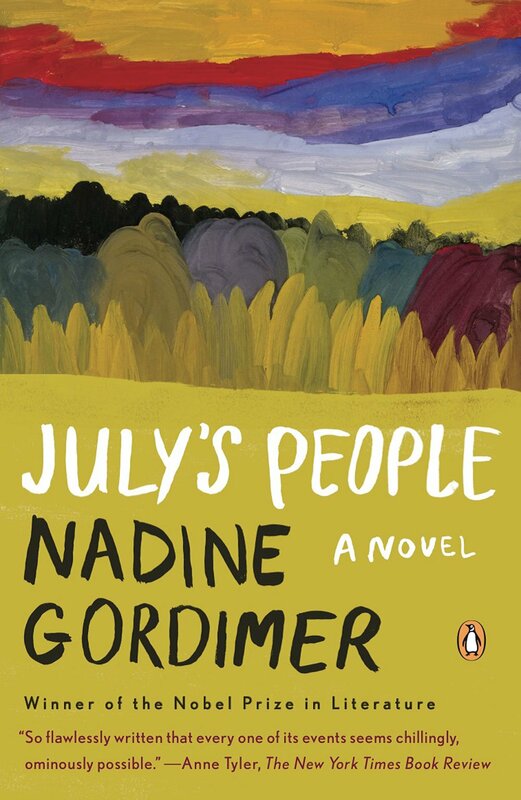 Gordimer eloquently explores the challenges of racial divide in her native South Africa, putting a face to the complexities of life in an apartheid world. A thought provoking book that draws in the reader with strong characters and interesting relationships, July’s People should be included in your book group’s list of reads this year. Russell Banks’ new collection of short stories, A Permanent Member of the Family, is one of the best books I have read recently. The characters and the moral dilemmas in which they find themselves entangled continue to simmer in my mind. Intentional or not, as a reader, I noticed the theme of death emerge as I read this collection of short stories. That being said, I must report that reading this collection of stories is not depressing, but rather a thought-provoking experience. Whether we like to acknowledge this or not, death is a permanent member of every family. Death reveals itself in an array of forms: death of a person or animal, death of a relationship, an image, a dream, a fabricated life, and so on. 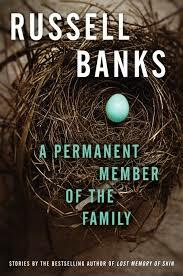 Banks’ writing engages the reader swiftly into the lives of the characters presented in each of the stories who find themselves in a variety of perplexing situations. Here is a sample of some of the situations… In Former Marine, adult siblings realize their father has committed an outrageous crime and ask themselves, “Can this be my dad?” The story Blue presents a woman alone and inadvertently locked overnight in automobile sales lot with a ferocious pit bull dog… is she a criminal or victim, how will this situation end? Top Dog explores the effects of success bestowed on one member of a group and the repercussions to the dynamics of their longstanding friendship. The twelve stories in this collection encompass a diverse selection of characters from a cross-section of society. A Permanent Member of the Family is a satisfying read. Be sure to add it to your reading list. Everyone has a list of “Books to Read.” Remarkably, there are titles that seem to remain on “the list” but are repeatedly overshadowed by the stream of newer items added to “the list.” For me, The Cellist of Sarajevo was one of those books. Having just completed this book, I urge you to push it to the top of your list and read it. This story puts a human face on war. It explores how individuals, innocent bystanders, attempt to live their lives in the midst of war, challenged daily to perform basic tasks which can have life or death consequences, and strive to maintain their sanity and a semblance of humanity despite the danger, destruction, and chaos brought into their everyday existence. Based on a real life event, The Cellist of Sarajevo is the story of a cellist who, in the midst of the Bosnian war, witnesses from his window a mortar attack that kills twenty-two people standing in a breadline. In an act of respect, defiance, or an attempt to bring some peace and beauty to his war-ravaged town, the musician embarks on a daily ritual of playing his cello in the town square, in plain sight of enemy combatants, for twenty-two consecutive days. Also featured in this story are three ordinary townspeople: Arrow, a young woman sniper dispatched to protect the cellist; Kenan, a family man who dutifully procures water for his family and an elderly neighbor; and Dragan, a baker who remains in Sarajevo to protect his home and belongings after sending his wife and son to seek refuge away from the city. The lives of this four-some intersect and have profound bearings on their existence, although each is not aware of this. The author’s beautiful prose poetically describes the setting, daily existence, and thoughts of the four main characters. The reader is compelled to reflect on each sentence and ponder the images conjured up in his or her mind. I listened to this story as an audiobook, which has the added bonus of cellist Sarah Butcher playing Albinoni/Giazotto: Adagio in G minor, the adagio featured in this story. Whether you check out the audiobook, as I did, or the book, I urge you to push The Cellist of Sarajevo to the top of your list and read it. You will be glad you did. Check the WRL catalog for The Cellist of Sarajevo. Check the WRL catalog for the audiobook. For book groups, it’s also available as a Gab Bag. Youth, beauty, materialism, and other facets of contemporary culture permeate the cinema landscape today. 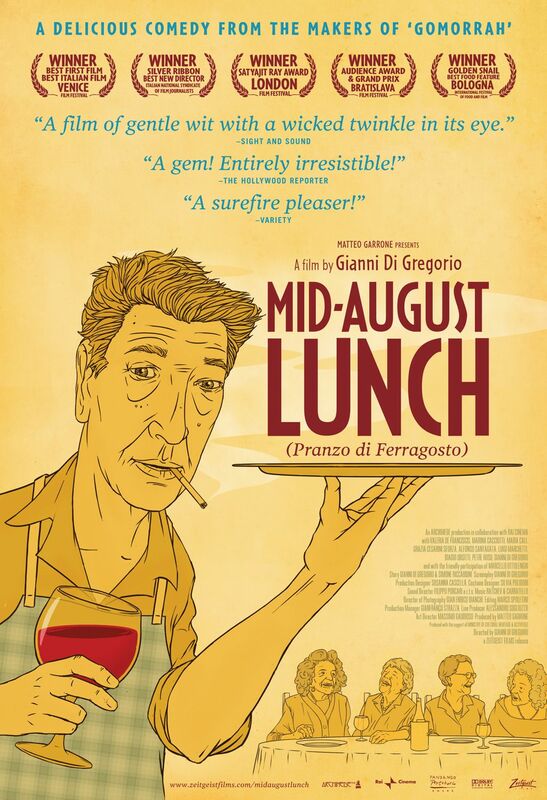 Mid-August Lunch (2008), a gem of a movie, is the antithesis of these themes and should not be missed. The storyline is gentle, uncomplicated but rich, and leaves the viewer with considerable substance on which to ponder long after the film is over. The movie begins with Gianni, a middle-aged man who lives with and cares for his elderly mother in her small apartment in Rome. Gianni inadvertently finds himself providing respite care for three additional elderly women, whose families have gone away on holiday to celebrate Ferragosto. Initially displeased with their disposition, after being dismissed to the care of a complete stranger, the women and Gianni try to make the best of this rather awkward situation. Liberated from the confines of their prescribed roles within their families, the women’s more youthful, true personalities begin to emerge as the afternoon evolves. Later that evening, one of the women confides to Gianni, “We live on memories. Without memories what would you do?” The following day the women and Gianni prepare their own Pranzo di Ferragosto celebration meal, creating new memories for each of these new friends. Mid-August Lunch is a directorial debut for Italian actor and screenwriter Gianni Di Gregorio who also plays the central character of this film. The calculated simplicity of this story and the cinematography, which features close-ups of the actors, images of the delicious meals prepared, and quintessential scenes of Rome work together to create a rich story. The viewer readily connects with the characters, seeing the individual within each of the women, as well as the caring and generous Gianni. Foreign language film viewers who oppose subtitles should not dismiss this movie. The dialogue is not complex and moves at a comfortable pace; the viewer quickly forgets she is reading subtitles. Charming scenes of the story unfold during the final credits… do not shut the DVD player off too quickly. I urge you to see Mid-August Lunch, and, if you are like me, you will tell your friends and family to do the same. This is a thought-provoking book that explores the joys and heartaches of parenting through the story of two families living disparate lives. A baby girl is born to a family of little means in a remote village in India, in a culture where boys are the preferred gender. The infant’s mother, in order to save her baby’s life, makes the heart-wrenching and selfless decision to secretly relinquish her daughter to an adoption agency in Bombay. This child’s lot in life is drastically changed when she is adopted by a childless couple from California. The child’s new parents, both physicians, have the means and education to give their daughter all the opportunities and luxuries that money can buy. The novel follows the parallel stories of these two families, living literally and figuratively worlds apart, as their children grow up. Of course, the two families’ lives do intersect when the American daughter, as a college student, makes a trip to India, seeking to gain an understanding of her identity and why her birth mother gave her up for adoption. The reader observes that the joys, trials, tribulations, heartaches, disappointments, missed opportunities and sorrows that go hand in hand with parenting are universal. Secret Daughter was a good read, filled with rich descriptions and dialogue, giving the reader a strong sense of place and believable characters with realistic problems. I found that I enjoyed the story even more after discussing it with a colleague who recommended this book to me. 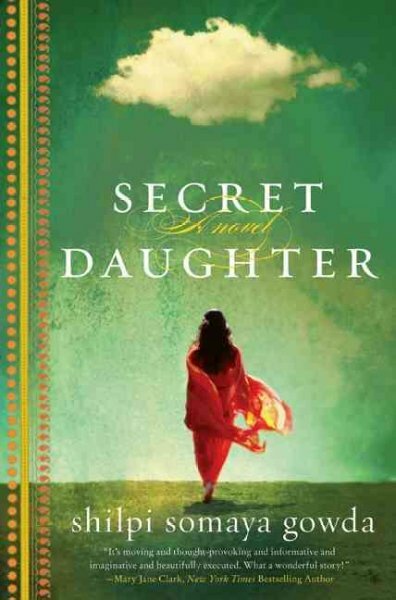 If you are looking for your next book group book, consider Secret Daughter. This story will generate lively discussions, particularly if the group includes parents of young adults who likely may have weathered many of the themes presented in this story. 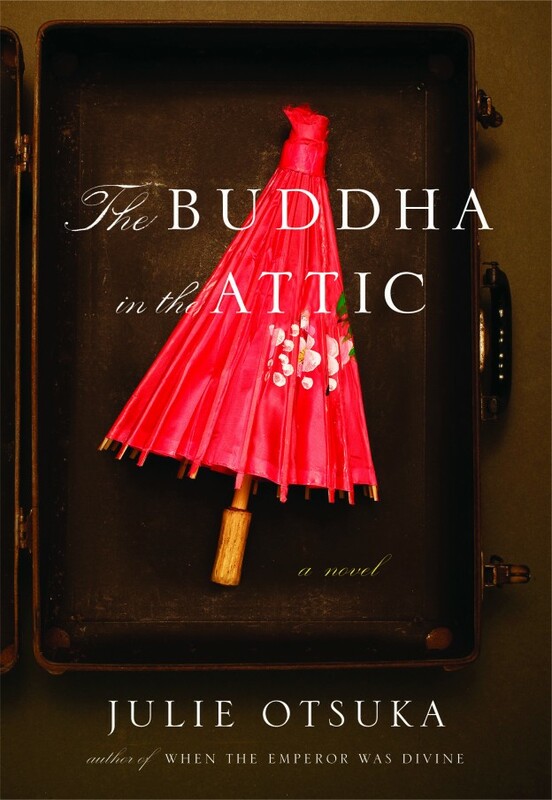 Julie Otsuka’s, The Buddha in the Attic, might be a little book, but within the 127 pages is a big story that lingers on the reader’s mind long after the final page has been read. Otsuka tells the story of the Japanese “Picture Brides” who immigrated to the United States in the early 1900s, established new lives in a foreign land and tried in earnest to gain a piece of the American Dream. The themes explored are those familiar to many: growing up and leaving home, homesickness, friendships, working and raising a family, and the accompanying joys and sorrows of life, marriage and parenthood. The book recounts hardships encountered by the Japanese American immigrants during the early twentieth century through their relocation to internment camps during the Second World War. What makes this book so profound is the style the author employs to recount this melancholy and little discussed segment of our country’s history. The story is told in the collective voice of the immigrants, interspersed with voices of the individuals, sharing personal feelings, experiences, observances and anecdotes of their lives. Otsuka carefully chooses her words, sparse and poetic, creating a story whose prose are hauntingly beautiful. Do not rush through this book, but rather pause and reflect as your read it. I find I cannot stop thinking about it. It is the best book I have read this year. P.S. I whole-heartedly recommend Otsuka’s first book, When the Emperor Was Divine, which I read while waiting for my copy of The Buddha in the Attic to arrive. It is an equally moving book. Today’s post comes from Babette, who takes us to France. It is certainly hard to believe that as a librarian I found myself at a coffee shop one morning without a book in my bag and about 30 minutes to kill. I browsed the “give-away” shelf and one book immediately caught my eye, From Here, You Can’t See Paris: Seasons of a French Village and Its Restaurant by Michael S. Sanders. It was both title and cover photograph (a quintessential French countryside scene… tables and chairs in an outdoor café-type setting, potted geraniums, and climbing vines meandering up limestone houses, all this perched atop a winding road overlooking a peaceful vista of a small village in the distance) that called me to pick up this book. And, was I glad I did. 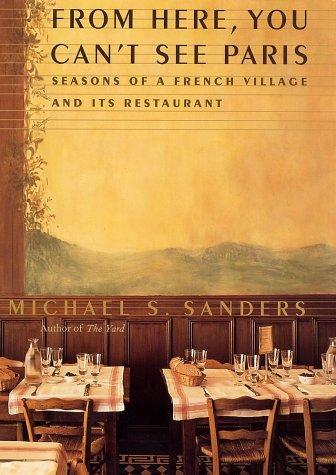 The author, an American, sets out for a year to observe, experience, and record the life of a small chef-owned restaurant in Les Arques, a small village nestled in southwestern France. This is not simply the story of the restaurant and its owner, but, of the village, its inhabitants, and the struggle of this rural town to defy the likelihood of becoming extinct as the dwindling year-round population ages. The restaurant, La Recre (short for “playground”) is housed in a revitalized old schoolhouse building located in the center of the village. Outsiders to Les Arques, Chef Jacques and his wife, Noelle, have cultivated a thriving business over the years and, subsequently played an integral role in the renaissance of this rural village. The challenges and dramas of running a successful restaurant are illuminated in this book. An underlying theme explores how the viability of Les Arques depends upon its ability to retain traditions of generations past while being relevant in the twenty-first century. The push and pull of these opposing goals provides the tension in what would appear to be a book solely about a restaurant and food. A keen observer of life in Les Arques, the author introduces the reader to the residents, their relationships, and the hum of life in this rural village. As the title suggests the book is ordered according to the seasons of the year and the events in the village’s calendar, including outdoor markets, truffle season, town meetings, local elections, blissful summer days, and the dreary winter months. All of these make for an interesting glimpse at life in this rural French village. Peppered throughout the book are French phrases and rich descriptions of the town, its residents, and the countryside, all of which give the reader a real sense of being in southwestern France. As the book progresses the reader becomes immersed in the lives of the villagers, who quickly become new friends and acquaintances. This is the perfect book to fulfill one’s fantasy of escaping from one’s current life to a world that is tranquil, but never boring, and gentle and satisfying. I encourage you to read From Here You Can’t See Paris, images of life in Les Arques linger with me still.